click here to see a longer list of our "tops for the trail". Erika Pochybova-Johnson was born in Czechoslovakia and grew up in the foothills of the Carpathian mountain range in Slovakia. She has lived in Lubbock since 1996 and, after a career in the healthcare industry, she left to pursue her art full-time. You can see her style of european folk art this Friday at the Charles Adams Gallery in Kingsgate North. The event is open to the public and free. Complimentary beverages and Slovakian style snacks will be served from 6:00 pm to 9:00 pm. Friday evening, featured guest speaker and artist Kathryn Clark, from Brookston, Indiana, will give a gallery talk during the reception starting at 6:30pm. Clark and her husband founded Twinrocker Handmade Paper which was the pivotal in the modern revival of handmade paper in America. Her work was featured in the Crafts, Etc. exhibit in the Fine Arts Gallery last December and January. Jo Henderson brings about 30 of her altered suitcases to Faux Real Art Studio for Friday Friday exhibit. Suitcases and briefcases covered in designs are inspirational and affordable! Jan Brownlow also features her amazing and affordable jewelry from turquoise to multicolored stone pieces. Sam Collins has his "wire men" on exhibit -- sure to intrique any child. Click here to see a longer list of our "tips for the trail" stops. Get Crazy with Paper this Saturday! Join the BHC staff and volunteers as we get creatively crazy with paper! BHC volunteer Linn Hughes will guide kids of all ages through fun activities all made from paper! Date: Saturday, April 7, 2007 Time: 1pm - 4pm Cost: Free! Opening home game is April 15! Get your tickets now and plan to join us. This is the football you love -- but better! Faster, hard-hitting, higher scores, with Tech players you have known and prices that are very affordable with tickets starting at $12.50. With 8 season home games at the Lubbock Municipal Coliseum, the Renegades promise to bring the ultimate indoor football experience to Lubbock. We're a sports town and we deserve a team like this! Click here to visit their website and look around! We need a few fun, nicely spirited people to help us hand out things at events in the next month coming up -- specifically for the Renegades game on April 15 and Lubbock Arts Festival (April 19 - 22).. If you like to get out and be involved and lend a hand, we could use the help! Click here to let us know. Weekends through March and April - "Peter the Rock"
April 12 - 14 - Man of La Mancha - The Glorious Quest! 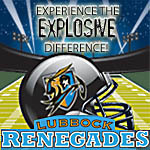 April 15 - FIRST HOME GAME for NEW TEAM - Lubbock Renegades! Click here to visit their website and look around! Learn the art of drumming with this informal class, led by local percussionist Russell Jones. Russell is a local musician and drummer with the Lubbock band The Ducks. This beginning drum class will teach students ten years old and up the basics of drumming in a relaxed and fun environment. Drum kit will be provided for student use during class, but students are asked to bring their own sticks. The Buddy Holly Center Gift Shop sells drum sticks for $4.59 per set. April 21st at the Civic Center Cost: Free! 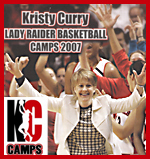 Kristy Curry Summer Camps are scheduled and ready for registrations. A special camp for parents/daugther and grandparents/granddaughters to learn the game of basketball with Texas Tech's staff and players. Each parent/daughter "team" will be taught proper techniques in shooting, passing, ball-handling, and defense. This camp emphasizes basketball fundamentals and techniques that every player can practice and use throughout the year. It also give parents and their daughters the opportunity to be together in a unique setting. April 19 - 22 - Lubbock Arts Festival! This is always a fun time and the Lubbock Fun Club is involved too! Click here to see all the highlights. April 28 – RANCH DAY at the Ranching Heritage Center All day!